Freewheel tools are generally made of forged steel, that's occasionally chrome or brass plated, but most frequently left as black colored steel. 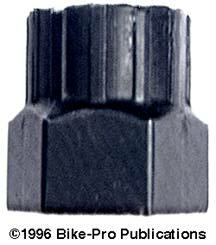 The tool has several externally protruding notches, referred to as "dogs" professionally, or "prongs" politely. The wheel is removed from the bike and the freewheel side axle nut, or the hub skewer is removed. 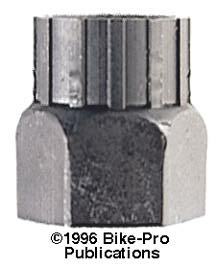 The freewheel tool slides into the freewheel over the axle, then the axle nut or skewer is replaced, and tightened. The tool installed on the wheel is then tightened in a bench vise, and the wheel is turned just slightly counter-clockwise to break the freewheel free, just slightly. Then remove the wheel, loosen the axle nut or skewer, and then using the tool loosely in the freewheel, complete it's removal. As an alternative to a vise, a large, (at least 15"), adjustable wrench may be used. TNT makes two models as replacements for the steel HyperGlide lockrings. This the outer lockring that turns into the interior end of HG rear hubs. TNT makes a beautifully machined 7075-T6 aluminum alloy aftermarket replacement. The lockring is turned on a lathe from 1 1/2" diameter rod to perfect the shape, then counter-drilled from the backside. The front face is given the required twelve notches by milling each of them into it. The threads are then carefully cut onto the rear of it. This piece replaces any of the original Shimano lockrings. There are two models made, one replaces the 11 the lockring for cogsets that have an 11 tooth cog in the first position, the other is used with 12 tooth first position cogs. The variation is the width of the flange. The width is 6.68mm on the 11t and 8mm on the 12t. The flange of the 12t model is too wide for the chain to work as an 11t replacement, but the wider flange makes the cinch of the more secure. Both the Park FR-5 and the Shimano TL-FW30 fit into these lockrings for installation or removal. The Chrome plated steel original lockring used in the HG90 cassette weighs 13 grams, the 11 tooth weighs 5 grams and the 12 tooth weighs 6 grams. The TNT lockrings come anodized in Blue, Black, Lavender or Silver. Perfect for anyone who possesses an Action Tec or SRP Titanium cassette set. Park Bicycle tools, of St. Paul, Minn. USA, makes many of the tools used by professionals in bicycle stores worldwide. Their freewheel tools are made of forged, and machined heat treated, steel, as a single piece, then colored Black. There are five versions to accommodate most all freewheels in current production. Note: the FR-5 removes the outer lockring on Shimano HG50, HG70, and HG90 cassettes, you will need additionally a "Chain Whip" to hold the cassette on the wheel stationary, (see below). "Chain Whip" is a generic term for a tool that has a 12" handle made of a steel bar with two lengths of bicycle chain fastened to it. Two of these tools are required when you want to remove and change singular cogs, that are threaded onto the freewheel body. One tool is used to hold a large freewheel from turning, while the other grips and breaks free the smaller, threaded, outer cog, (or cogs) which you need to remove, to access all the cogs on the body. The Cassette Cracker is a miniature chain whip for freeing up and removal of the first position cog on freehubs where no outer lockring is used to hold all the cogs on. Neither bench vise or adjustable wrench is required for its use. It is an aid in cog removal for spoke changes. With the bicycle chain on the smallest chainring and the largest rear cog, and the right crank arm at the three o'clock position, a vinyl coated steel hook grips the bike from the upper-inside of the right chainstay. The Crud Claw is an on-bike mud removal device. It is held on the bike by the rear hub's quick release on the outer side of the wheel drop out. It is from of die-cut aluminum plate with a bend to make a platform for the plastic claw to bolt to. The Claw is made of molded Black plastic and has six fingers that slide between the inner cogs. As the rear wheel rotates the fingers knock off mud and dirt between the cogs. The Crud Claw will work with all types of drive trains and cog sizes both standard and compact style. It weighs 21.5 grams. The aluminum bracket is anodized in Black, Lavender, or SIlver.